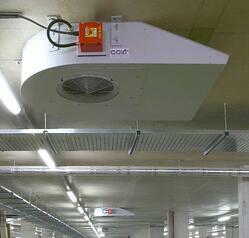 Enclosed or underground car parks normally require ventilation systems to assist firefighting operations. These systems generally also prevent the build-up of carbon monoxide during normal day to day use of the car park. This presentation is available to watch online now as a recorded webinar. To access, please fill in the form opposite. If you would like us to issue you with a CPD Certificate then please fill out our evalutation form. The presentation slides for this webinar can be downloaded here. This presentation is also available as a seminar which can be held at your offices at a time to suit you. Usually this is over lunchtime. Each seminar normally lasts around one hour. We also offer seminars at our headquarters in Havant, where you may visit our manufacturing facility. Attendees are provided with full supporting documentation and Certificates of Attendance are awarded on completion of the seminar. To book a seminar at your office, please contact us. All webinars are at 12:30 UK time. © 2017 Colt International Licensing Ltd. - People feel better in Colt conditions.